It feels slightly weird sometimes to be part of an archive. Are you still alive if bits of your past are boxed up in climate-controlled conditions with books and records going back to pre-Christian times? I found myself wondering about it when I met Laura Outterside, a researcher who is writing a dissertation on poets and other artists who have already given parts of their personal papers to archives for preservation. Laura, a delightful and friendly person who is as lively and funny as she is analytical and inquiring, wanted to know how I first came to deposit papers (letters, research notes, poetry mansucripts and other things) in Manchester’s John Rylands Library, and also whether it changed the way I felt about my own notebooks, letters and emails, and how I felt about other people possibly using them in future. 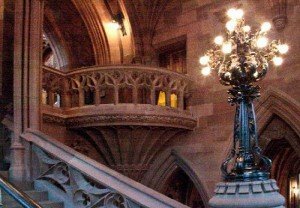 It was actually the Rylands that approached me first of all back in 2001, as they were interested in the material I’d collected in the process of editing the works of Thomas De Quincey, the Manchester-born essayist and Romantic-period ‘Opium Eater’. Later, my own poetry notebooks and many letters, including those to me from the poet and scholar Kathleen Raine, went into the Rylands’s Modern Literary Archive – a collection of papers from contemporary writers, then looked after by one of its founders, Stella Halkyard, and now by the wonderful and meticulous Fran Baker. Fran also has the huge task of caring for the archives of Cartcanet Press, the Manchester poetry publisher, to which they’re now adding email as well as paper. A formidable mass of material! I don’t have a lot of personal attachment to my old notebooks, incoming letters, manuscripts and so on: they feel like the dead leaves a tree has shed. I’ve moved on, or I hope I have. But if other people find them interesting or useful, that’s great. My guess is they will be used for things I can’t even imagine. Who knows what will interest people a hundred years from now? If they find my bits and pieces useful, then that’s great. But I am curious to know what Laura will come up with. What will other writers and artists say? What ideas do they have about these accidental by-products of their work? I hope Laura will let me see what she writes.